Today.Az - When Azerbaijani population to reach 10mln? The population of Azerbaijan will reach ten million people in late March - early April, Chairman of the State Statistics Committee of Azerbaijan Tahir Budagov told journalists within the framework of the presentation of the project "EU Support for the State Statistics Committee of Azerbaijan to achieve European standards" on February 22. Budagov said that these forecasts are made based on calculations of the State Statistics Committee of Azerbaijan. Note that the population of Azerbaijan as of January 1, 2019 reached 9,981,457 people. As many as 52.8 percent of the total population lives in cities, 47.2 percent in villages, 49.9 percent are men, 50.1 percent are women. The population density is 115 people per square kilometer. As of the beginning of this year, 4.6 percent of the population lives in Nakhchivan, 22.8 percent in Baku, 20.3 percent in Aran, 12.9 percent in Ganja-Gazakh, 9.4 percent in Lankaran, 30 percent - in other economic areas of the country. According to the population census in 1897, Azerbaijani population was 1,806.7 million. In this period the majority of people lived in rural areas - 83 percent. 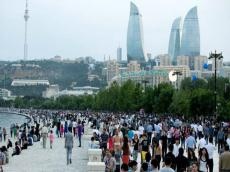 At the time, 112,100 people lived in Baku, and according to the data for the beginning of this year, the population of the Azerbaijani capital is more than 2,262 million people. The next census of population will be held on October 1-10 this year. In 2018, a test population census was held in Gabala district. The UN previously reported that Azerbaijan’s population is expected to hit 10.68 million people by 2030 and 11.03 million people by 2050. The report forecasts that life expectancy at birth will increase in Azerbaijan. So if in 2015-2020 it is 72.1 years, then by 2045-2050 will increase to 75.7 and in 2095-2100 - to 82.6 years. As for the world population, the figure is 7.6 billion people. By 2030, the world will have 8.6 billion people, in 2050 - 9.8 billion, and in 2100 - 11, 2 billion.